I was six years old standing at a stranger's door at an apartment complex in inner-city Atlanta. My dad stood beside me wearing a white t-shirt labeled “Hope for Kids.” Our job for the day, I was told, was to tell the neighborhood about a fair down the street where they could get free “shots.” I couldn’t conceptualize why anyone would want to condone themselves to such agony. A free shot sounded like a terrible thing to be handing out. But, I was told some didn't have access to this medicine to keep them well. So I knocked, nonetheless. I remember being introduced to new smells, sights and sounds. I remember listening to my parents talk so kindly to people that looked and spoke differently than I did. And then there I was, a nine year old carrying brown bags beside my sister. I remember being hungry myself as I hadn't eaten since breakfast. But there were people, I was told, that hadn't eaten in days and I wondered what that level of hunger felt like. I remember the man who took it. He had torn clothing and kind eyes. And those nights, the ones where the sitter would watch us because mom and dad were at a “meeting.” I now know it was board meetings for a local non-profit adoption agency. And I would see their work come to fruition as I stood at the terminal and watched children who spoke a different language cling to their new parents as their new appendage, a new family being formed. These kids didn't have parents, I was told. But now they did. I remember seeing joy, the exchange of the parents hope fulfilled and a new world of wonder before the child. I didn’t have a perfect childhood. But then again, who did? My parents were amazing but I still experienced relationship challenges with them, my siblings, the loss of people I loved, health issues and the stresses of peer pressure. But as I look back on my first 18 years of life, the moments that stick out to me most are those where my family served together. They weren't profound experiences, in fact very much the opposite. Being around people who looked different, acted different, were different... became a part of the fabric of who I am. The regular presence of difference in and of itself created normality. And so, when I left the nest of my home to go off to college, I naturally set off to find a place to serve, continuing my “normal.” This search for consistency in my newfound adulthood led me to find the beautiful community I now adore, ESP. And here I am, now in my 30’s and a parent myself. I see that it wasn't convenient for my own parents to put us in these circumstances. It took work, coordination… love of others over love of things. 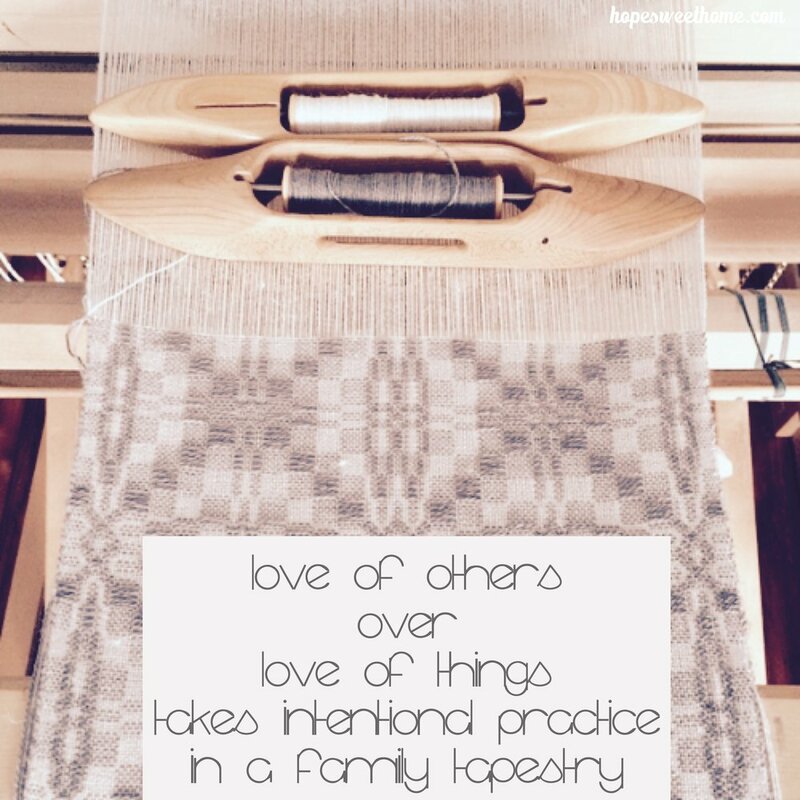 It was an intentional practice in our family tapestry. The woven experiences intentionally provided created me into the person I am today. My fear is for my generation of parents- that we are unintentionally creating children who are so focused on ballet, football, batting practice and birthday parties and forgetting to be just as intentional about weaving experiences of difference, of service, of humility and of hope. That type of intentionality will be uncomfortable for us and often an inconvenience. It will take sacrifice of time, sacrifice of thought, sacrifice of money. But just as we spend $200 here and there for sports teams and after school activities, it is a similar investment that we choose to make, or do not choose to make, in the fabric of who our children are. Pray with your children about those who are hurting. Children pick up so much information when they hear prayer. Take two minutes to pray every night before bed or at the dinner table for friends who are sick, for children who are hungry and for the hurting. In doing so, you will not only place a seed of compassion in your children, but it will also be a daily reminder on your heart. Join a board or a committee. Children learn best by watching. Yes, it may take occasional time away from them, but in moderation the deposit you are making is worth far more. Talk to them about your “meetings” and what you are doing with your time away. Even if your child is a teenager, it's not too late to weave a small thread by your example. Make it relevant: The needs of Harvey are ever-present. Take a minute to research with your kids and give together. Muddy it up: I may be biased, but we are looking for families to join our family mud run on September 17th. Allow your children to support our ESP participants and while getting muddy! Make “Love Bomb Bags” (my silly name -- name your own!) These are simple kits of toiletries and snacks to give when you are out and see someone in need (watch out - your kids will often spot the need before you!). Add a new staple to your shopping trip: Whenever you are at the store, buy a few extra supplies and drop them off at your local Little Free Pantry. Most of these things, we can do with our eyes closed… while also feeding the dog, the baby, on our way home from work while stopping in to pick up kid #2 from dance. It simply needs to become part of our routine. Join me in being regularly intentional and setting an example as we weave a spirit of service into the future generation, the little hearts of those we are raising.